We implement local and national curriculum frameworks. 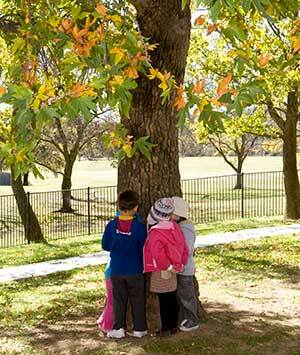 Our approach centres around play-based learning and focuses on children's interests and wonderings. Play Workshops are a key component of Preschool to Year 2 timetables, allowing children to interact, question, connect, problem-solve, communicate, reflect, and discover. Our Birth to Preschool educators use the Early Years Learning Framework to guide their practice and to 'provide young children with opportunities to maximise their potential and develop a foundation for future success' (Early Years Learning Framework, page 5). Kindergarten to Year 2 educators use the Australian Curriculum to plan, implement and assess learning and teaching. Play-based enquiry at LECS links to the explicit teaching of English and Mathematics outcomes. Children's progress across all key learning areas is tracked and reported to parents. We place a strong focus on all developmental domains, including social, emotional, language, communication and physical domains. As part of our daily program children have access to a wide range of equipment and resources. To avoid loss or damage, we encourage children not to bring toys in from home unless it is part of their learning program.